← A New New Year’s Challenge: Learn a Catechism! Well, I’m not a huge Sci-Fi reader, but I had seen the movie Ender’s Game and decided to give the book a try, and I’m so glad I did! One of my rules is that typically I won’t watch a movie until I’ve read the book first, but this was one of those cases where I didn’t know about the book (which was published in 1985) until after seeing the film. I still hold to my theory that the book is always better than the movie, but I am going to watch the movie again, now having read the book. This may not be the greatest science fiction novel – I don’t read that much sci-fi so I may not be the best judge – but I liked it. In the book, Ender is only six years old when he is first enlisted for Battle School. Having undergone an attack by an alien species referred to as the Buggers, Earth has already retaliated once, but is preparing for another encounter, hoping to defeat the threatening enemy for good. The government observes, monitors and tests children in hopes of identifying those who will make the best candidates to train for this army of fighters, but they are especially looking for the one individual that they hope can lead their army to victory. Battle School is no Summer Camp; while much of the training is in the form of video games, simulations, and team face-offs, it is grueling and demanding, especially for a six-year-old boy who is younger and smaller than all the other students and who doesn’t have a mean bone in his body. But Ender is a survivor and a genius strategist – one who can think outside the box, can think like his opponent, and can improvise on the fly. I just loved this kid and felt so bad for him as he became isolated and lonely as a result of being so bright and so good at what he did. How was he going to survive, when so many of the bigger boys resented him, were threatened and intimidated by his success and wanted to take him out? How could he ever make friends, or even know who he could trust or confide in? He even comes to believe that the authorities are not being honest with him or are just manipulating and toying with him. Ender moves up in the ranks quickly and is made a commander by the age of 11, a rank that is not normally assigned until age 16. He soon has earned the respect of many and begins to train his own group of followers. He’s not easy on his team, but they learn to trust his instincts and will follow his instructions, no questions asked. Battle after battle, Ender’s team goes undefeated against the other teams, even when the rules keep getting changed on him. As the training simulations get harder, more tricky, and less predictable, it begins to look like Ender has what it takes to eventually lead the armies of Earth to defeat their dreaded enemy. Ender isn’t sure it’s what he wants to do, but how can he turn away from his calling to save the entire human race from destruction, if possible? I don’t want to give it away, but when all is said and done, I believe Ender makes the best decision he could. Basically the reason Earth is at war with the Buggers is because each species misunderstands the other due to a lack of communication. Each makes certain assumptions about the other based on what they know and experience, but without knowing or learning anything about the other. Each side judges the motives and intentions of the other side by what they observe, and as a result draws false conclusions. It’s from this misinformation or ignorance that each side decides what action to take. How many wars have taken place, friendships ended, and marriages destroyed, simply because two parties are either unable or unwilling to take the time and effort to try to listen and understand each other? How many times do we judge someone based on external observation and draw wrong conclusions without confirming and trying to come to an understanding? The root cause of racism and prejudice is ignorance, and often ignorance turns to fear and eventually to hatred. Ender comes to understand that the Buggers acted in ignorance when they attacked Earth. In turn, Earth responded ignorantly based on assumptions drawn from the Buggers’ actions. Ignorance resulted in fear, which turned to hatred and retaliation. In the end, no one wins. But Ender never really wants to hurt or kill anyone. Along with a strong will to survive and an innate ability for strategizing against an opponent, he has a gentle, compassionate heart. Ender comments, “In the moment that I truly understand my enemy, understand him well enough to defeat him, then in that very moment, I also love him.” He realizes that learning to understand another being is the first step towards learning to love them. Ender discovers there might just be a way to “overcome evil with good,” a way to make up for the damage that has been done and to start over. He decides to take matters into his own hands with the hope of finding forgiveness, restoring a lost race and establishing understanding and peace where there once was ignorance, fear, and hatred. Good Luck, Ender. I look forward to reading the second book, Speaker for the Dead , to find out how successful you are! 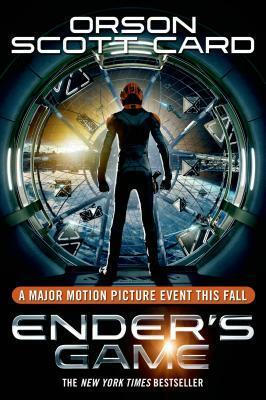 Have you seen the film or read the book Ender’s Game, and if so what did you think? This entry was posted in Adult Fiction, Young Adult Fiction and tagged Ender's Game, love your enemies, Orson Scott Card, science fiction. Bookmark the permalink. I like Orson Scott Card and did enjoy Speaker for the Dead almost as much. I read a fair amount of Sci-fi and Card does a fair job of it in my opinion. I appreciated his Pathfinder series even more than Ender’s Game. It’s a story about time travel, so it requires some thinking if you want to make sure you know what’s going on. It is a trilogy, unlike Ender which feels a bit like a tributary with all the books that have spun off it. I was never quite sure what was actually the next book.